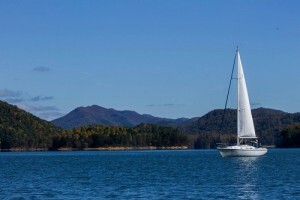 Watauga Lake offers pristine views of Cherokee National Forest and has been voted the third cleanest lake in the United States. The mountains of East Tennessee and views of North Carolina offer remarkable views that cannot be found elsewhere. In the summer months Watauga lake stays cold due to the high elevation, the number of natural streams and rivers including the Elk and Watauga River. From late April to the end of August the fishing can be world class. Largemouth and smallmouth bass can be found shallow chasing threadfin, american and gizard shad in the mornings and evenings. During the mid-day the largemouth, smallmouth and spotted bass can be found deeper on ledges, points and rockpiles. At this time of day hair jigs, traditional rubber jigs as well as shakey heads do well to catch bass hanging out in deeper water. 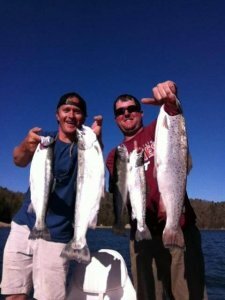 The spring and fall months on Watuaga Reservoir offer amazing fish catching experiences and heavy weights. At these parallel times of the year smallmouth, largemouth as well as spotted bass begin to feed heavily and will chase schools of bait fish in the back of creeks and start feeding on other types of forage including crawfish and bluegill and even trout! Bass Fishing Guide Trips and Half Day Waded Trout Trips by Boat! Trout fishing at Watauga Lake is noted to be some of the best in the region. With two prisine rivers running into the lake the trout fishing never ends. SAA guide service offers half-day bass fishing trips by boat and half-day wading trout fishing trips where our guides will take you up river by boat, beach the boat for lunch and continue wading the beautiful river for brown, rainbow and brook trout! Lake trout fishing trips are also available by request! Watauga Lake holds the state record for lake trout! Spring time offers beautiful rhodedendrum blooms as well as dogwood and other native mountain tree blooms. When the fall leaves turn it is a sight to see! 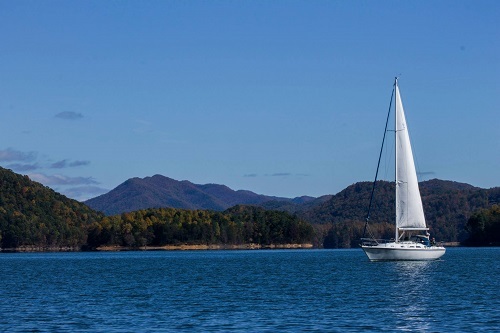 The beautiful mountains surrounding Watauga Lake offer some of the most beautiful scenes in this part of the country! Talk to your SAA fishing guide to learn more about what time to book your next trip and we will get you and your party hooked up! Construction of Watauga Dam began in early 1942 and paused due to Word War II. Work on TVA Watauga Dam resumed in 1946, and was completed at the end of 1948, impounding both the Watauga River and Elk River for the purposes of flood, hydropower generation and downstream navigation on the Tennessee River and Reservoir system. According to the 2004 TVA River and Reservoir Operations Study, Watauga Reservoir is approximately 16.3 miles long, with 104.9 miles of beautiful shoreline. The lake’s summer time water level target, also known as full pool, the lake covers 6,430 acres and the estimated depth of Watauga Lake is 265 feet located near the dam. At full pool, Watauga’s elevation is the highest of all TVA lakes at 1,959 feet above sea level. This high elevation offers wondering trout and bass fishing experiences for all! Book your guided fishing trip on Watauga lake, fly fishing for trout and bass fishing for largemouth and smallmouth bass!